The Carpenters were an American musical duo. 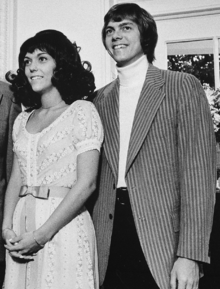 The members were Richard Carpenter and his sister Karen. Starting in 1969, the duo had many popular songs including "We've Only Just begun", "Close to You", "Sing", "Rainy Days and Mondays" "Calling Occupants of Interplanetary Craft" and others. They continued until Karen's death in 1983 of bulimia in Downey, California. They sold over 100 million albums. This page was last changed on 25 May 2018, at 12:24.